In late November 1896, a couple called Mr. and Mrs. St. John told the Tacoma Daily Ledger about a strange nighttime sighting. They told the reporter they were lying in bed around midnight, looking out the window. Mrs. St. John saw a strange light in the sky east of Mount Rainier. She woke her husband and he saw it, too. They said it was as bright as a lighthouse beacon. It flashed several times, and each time it flashed, various colored lights shot out from the center of the object like spokes from the center of a wheel. They saw the strange light move from the mountain, traveling southeast for several minutes. The couple did not change their position; they just watched it move – first from a window on the north side of their house, switching their view to a southern window. Based on the angle, this meant that the strange object moved a considerable distance. Did this strange object reappear over fifty years later? Because it was seen again in 1947, and this sighting led to the popular use of the term “flying saucer.” The phrase owes its existence to a newspaperman’s misquote of a pilot named Kenneth Arnold regarding a strange experience he had on June 24, 1947 – one similar to the St. Johns’ experience in 1896. Kenneth Arnold lived in Boise, Idaho, where he owned a business that made and installed fire control systems. Business must have been slow in the summer of 1947, because Arnold spent June 24 in his airplane, flying over the Washington Cascades. He was looking for a missing Marine airplane, hoping for a ten thousand dollar reward. At 2:50 p.m. he was flying east over the mountains toward Mount Adams, when he saw nine large metallic objects flying objects. These flying objects were about twenty-five miles away, at an elevation of ten thousand feet, traveling very, very fast. He noticed that they did not fly like ordinary aircraft (in straight lines), or make wide turns. Instead, they dipped and swerved, seeming to follow the mountain peaks from Mount Rainier to Mount Adams. Arnold started the stopwatch on his airplane control panel. Based on the distance between the two mountains (forty-five miles), and the time it took them to travel it, he estimated they were traveling at twelve hundred miles an hour. At first Arnold thought they were jet aircraft, even though their speed was far faster than that of the early jets in 1947. 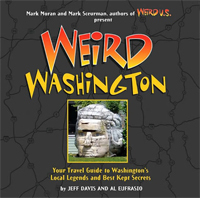 Once the strange aircraft vanished in the distance, Arnold continued his search, until he landed in Yakima, Washington. He reported the incident to the Civil Aeronautics Administration, and the next day flew to Pendleton, Oregon, where the press mobbed him. He gave several newspaper and radio interviews, describing the encounter. 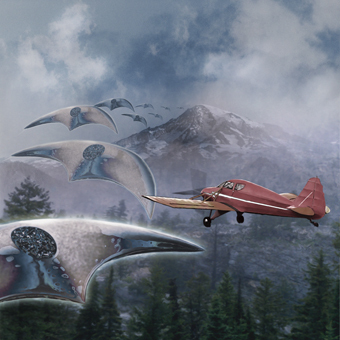 Before Arnold’s sighting, there had been earlier reports of similar objects (see Maury Island), and the press and U.S. Government always referred to these objects as Flying Disks – as did Arnold. He told the reporters that the nine craft were about a hundred feet across, thin, and disk- or crescent-shaped. Although the front of the craft was round, the rear looked chopped off and came to a point. He said that he was amazed that there was no tail, as on a normal aircraft, and that the craft did not make any noise. When one of the reporters asked him how the craft maneuvered, Arnold replied that they moved kind of like a saucer would move if someone skipped it across a lake. The reporter wrote down that Arnold said the aircraft looked like flying saucers, and the misquote stuck. Although this was not the first unidentified flying object ever reported, the publicity set off a rash of reports. After a radio interview, a number of people from the Seattle area and the Midwest contacted the media and reported seeing multiple flying objects on the same day. On July 4, a United Airlines flight crew reported seeing flying objects over Idaho. A few days after that, on July 8, another flying saucer was reported to have crashed in Roswell, New Mexico. Newspapers contacted military officials, who denied that they were testing experimental jet aircraft in the Washington Cascades. The military in turn interviewed Kenneth Arnold as part of their own investigation. Their questions centered on other natural phenomena that could have been responsible for the objects. Someone suggested water drops on the airplane window. Arnold replied that he had wondered the same, but that when he rolled down his window, the objects were still there. Others suggested that he got the time wrong, or the distance, which would have given him the wrong speed. Skeptics believed that Arnold could have been fooled by mirages created by air inversions, or even reflections of his own airplane off the atmosphere. Later, someone suggested that he’d seen a swarm of meteors that flashed and burned out quickly. Despite these suggestions, the Air Force could not prove Arnold was mistaken. This investigation led them to form special investigation teams that eventually turned into Project Blue Book, a formalized government investigation of UFOs undertaken from 1952 to 1970. Eventually, Kenneth Arnold came to the attention of publisher Ray Palmer. Palmer published a variety of magazines on science and science fiction. He interviewed Arnold and published an article titled “The Truth about Flying Saucers” in the first edition of Fate magazine. Palmer also paid Arnold two hundred dollars to investigate the Maury Island Incident, which became another article in Fate. In 1952, Arnold and Palmer published a book about Arnold’s experiences entitled The Coming of the Saucers. The issue of whether UFOs are really flying craft from outer space is full of controversy, and much of this controversy (and even its central term!) has its beginnings in our home state. 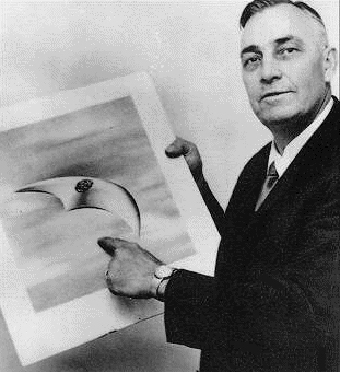 It is interesting to note that although skeptics do not believe that Kenneth Arnold saw flying machines from other worlds, none of them accuse him of deliberate fraud. Arnold’s honesty and openness led the way to open discussion of the phenomena.